This is a fascinating insight into some of the most important thinking of the industrial revolution in Israel. Technological revolution, rapid industrialization and higher levels of productivity all drew more and more people from the agricultural workforce and new ideas were needed to combat this serious loss of labour. At the time this book was first published, Professor Halperim's had somthing new and original to offer. He argued that agriculture could be combined with industry without undermining that age-old social asset, the village community, and bring it into line with changing conditions. As he predicted the development of areas comprising a score or more of villages, ranging around non-agriculture has been preserved, and rural society has continued to exist although it has assumed different forms. 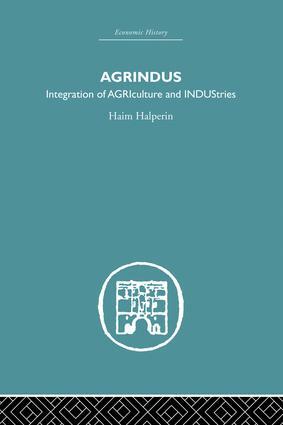 The name proposed by the author for this new formation is Agrindus, as it expresses the integration of AGRicultureand INDUStries.